You will watch The Simpsons Episode 513 Homer and Apu online for free episodes with high quality. Online episode guide, The Simpsons Episode 513 Homer and Apu Homer and Apu After twice getting food poisoning from expired food sold at the Kwik-E-Mart, Homer teams up with Kent Brockman to report Apu. Apu is fired from his job and comes to stay with the Simpsons, and he is replaced by actor James Woods. Homer resolves to help Apu get his old job back, and the two travel to India to talk to the owner of the Kwik-E-Mart, but are unsuccessful. Apu decides to visit his old Kwik-E-Mart and saves James Woods’ life. 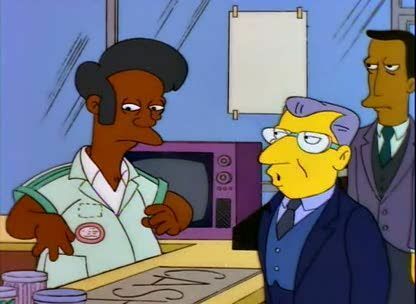 Woods is so grateful that he helps Apu get re-hired.